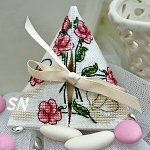 Such a pretty sewing set... we have a biscornu that matches these. Worked on 32ct Antique White Belfast linen in DMCs and embellished with a touch of gold beading, these are full of brilliant pinks and bold greens. Every piece in the set features a slightly different version of the signature design, so everything matches but is unique! Offered as two different charts. 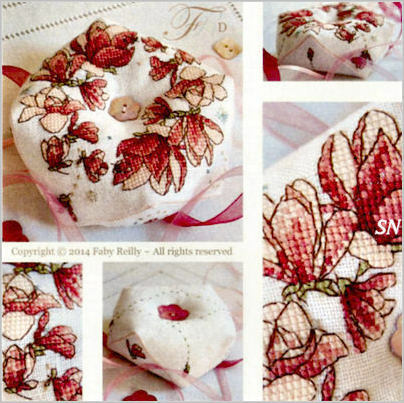 Faby Reilly has a new floral Biscornu design -- just as delicate and sophisticated as the rest of her collection. Luscious, soft pinks and brilliant greens... 11 shades of DMC in all. 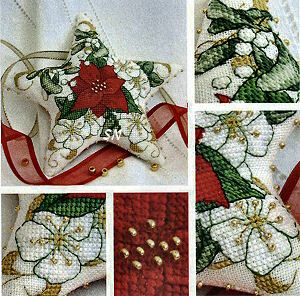 Beautifully presented in chart format with great pictures of the stitching detail, the flower centers are garnished with gold seed bead embellishments. 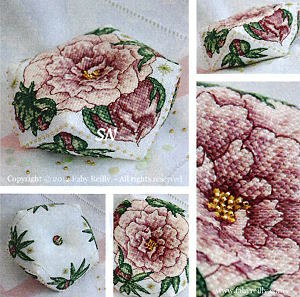 A mere 66 x 66 design, the bottom side of the cushion features smaller blossoms -- you might be able to see them peeking out in one of the pics. 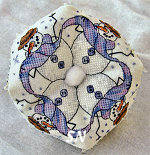 You might recognize this design -- part of it appears on Faby Reilly's High Seas Biscornu! A gorgeous flurry of rolling waves... this is an exciting band of turbulent waves, some happy little fish, a challenged sailboat (!) and the ever-stalwart Light House! Can you see the tone-on-tone nautical symbols in the background?? This would be pretty made into a long sausage-shaped pillow to display on a beach house window sill... or bands on a guest towel... or a pillow on the guest room bed! Charted for DMC... you can almost HEAR the crashing waves! 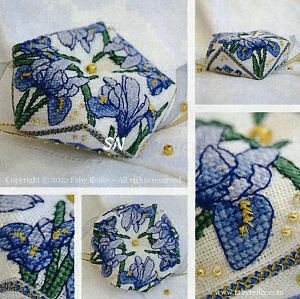 Faby Reilly does the most elegant florals -- so light and delicate -- we have a new set presented as a scissor case and fob with matching needlebook. 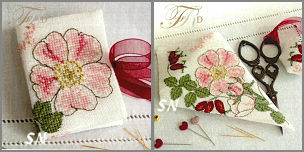 Some of the most beautiful charting by Creative Poppy on these, everything is worked in DMC floss on 32ct White Belfast Linen, and features a few gold seed beads in the rose center. The case finishes approx 3-1/2 x 5 -- and is stitched on both the outside sides and a little on the inside. 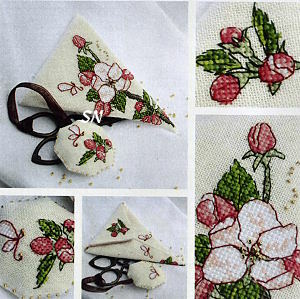 The scissor case is decorated with the same gorgeous pink roses and darker pink buds, and is the prefect size for a 3-1/2 or 4-inch embroidery scissor. 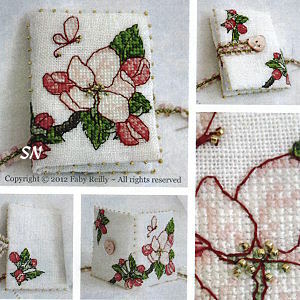 Offered in two different charts -- the needlebook in one, the scissor case and fob in the other. Just lovely! Aren't these colorful and fun designs??? They make me smile!!! Beautifully presented in chart format, we have 5 that are all simply stitched with good 'ol DMC floss!!!!! Click the pics to see them all! 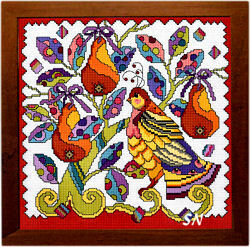 Partridge in a Pear Tree -- I have no idea where this would go in my house, but I absolutely LOVE the explosion of color! 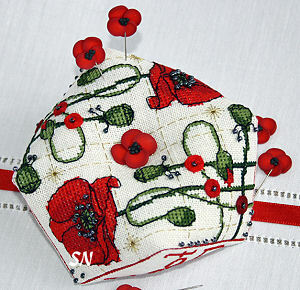 How can simple brilliant colors surrounded by thin black back stitching be so dramatic? 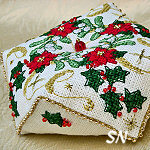 Choose any clean white fabric, this measures 129 stitches square. I've just noticed that they've tossed a little gold metallic in here -- in the pears!!! Floral Tree -- Another explosion of color, I think my favorite part is that tree trunk!!! 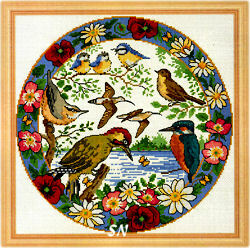 More backstitching, 28 yummy colors of DMC, this one measures 168 stitches square -- 12 inches square on 14/28. 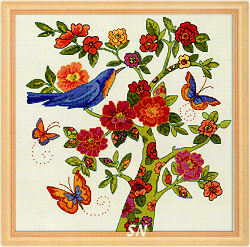 Birds in Summer -- Oh look at those little blue and yellow guys up there on the branch??? This measures 170 inches 'square,' so it'll be a 12-inch circle on 14/28ct. 40 Shades of your DMC, again, choose a crisp white fabric for this one. Oriental Floral Delight -- The tiny pic on the back cover of this shows a lovely blue silk pillow perched in a white wicker chair. How dreamy and peaceful it seems!!! 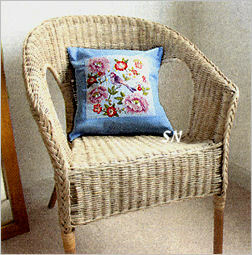 About 20 shades of DMC, choose a pale blue fabric for the background of this 140 x 140 design. Oh my gosh, this is the COOLEST stitched baseball cap!!!!!! 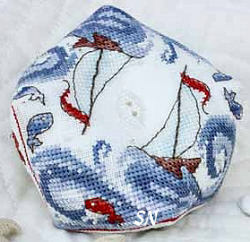 It is presented as a chart with tons of finishing instructions to construct this darling stitched cap. It calls for 28ct fabric. Choose any Lugana/Jobelan type of material over a linen. (Khaki, Cream, White, Light Blue???) There are no specific colors called for in the designs -- it is meant to use up all your odds and ends. 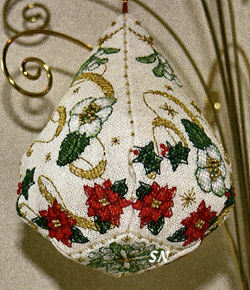 Simple Cross Stitches, the easy part is the stitching... there are 6 hat panels -- all with different motifs on them, and the peak -- the hat bill. Truthfully, the finishing scares the daylights out me! They give you 5 pages of diagrams, steps and 16 photos of the hat-in-progress. I guess I *could* do it... I just think the finishing should be left for a more adventuresome person!!! 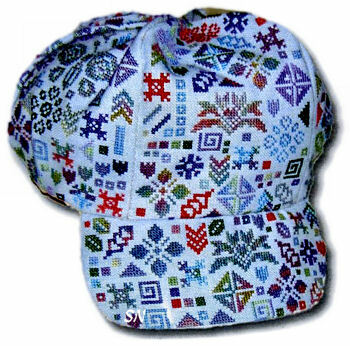 (Swap this out -- you stitch two sets, someone else finishes them -- you both get a cap! 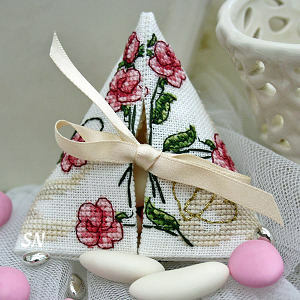 You stitch for her, she finishes for you!) Anyway, you might have a special friend who would love a stitched cap... this is awesome!!!!!!!! 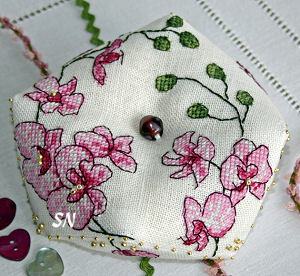 Here's a fun design -- a series of small florals all bordered with shapes of puzzle pieces! YOU MAKE THE PUZZLE!!!!!! This is super creative! The chart offers 30 different pieces, with 5 different border configurations. You can mix and match some of the insides and borders and rotate to make more different pieces. Then, you have the option of making your puzzle as big as you want! The cover pic shows 5 x 5 = 25 pcs. You can stitch a 225 piece puzzle if you make 15 across and 15 down! I am kind of blown away with the options you have with this... it is so cool! 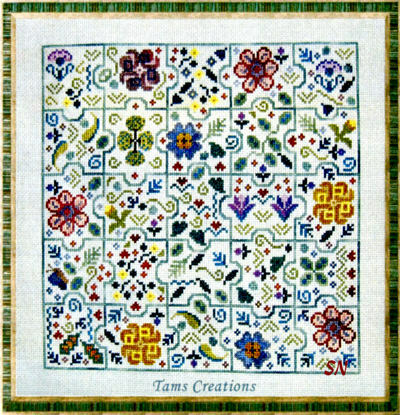 Charted with regular Cross Stitch using Gentle Art Sampler Threads, there are 26 different colors in here. The borders are all stitched with Green Pasture, and each piece measures approx 30 x 40 in stitch count. (2 x 3 on 14/28ct.) Study this a bit... can you see that the pieces with the big blue flower are not alike, but the pieces with the big yellow flower are the same, only rotated??? So... go little, go big! What a fun thing for a puzzle-lover!!! This is THE CUTEST LITTLE THING!!!! 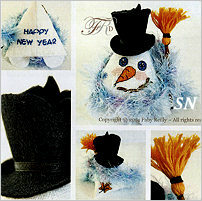 He's a little Happy New Year Snowman -- finished into a Humbug shape. He has feet, a felt hat, a wool scarf, (you can cut a bit of wool, or you can KNIT one!) and tiny broom that you make out of floss!!!!! 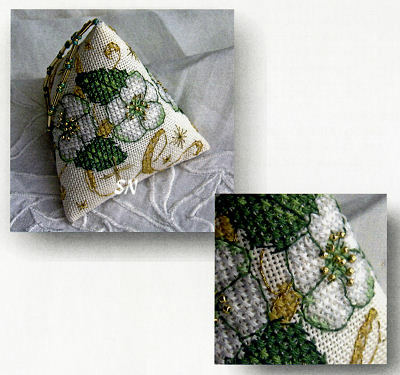 He is worked on 32ct white/opalescent linen and is approx 3 inches in size. The stitching is minimal. There is a little more to the finishing... but the chart supplies 7 pictures for the tiny felt hat, 19 more pics of the broom in its creative process, then 15 MORE pics of the whole thing being put together! Way too cute! 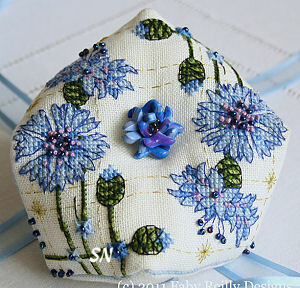 Here's another pretty floral pin cushion design -- a small study in delicate colors -- this joins our other 9 or 10 gorgeous cushions by Faby Reilly. I can't tell you which is my favorite -- every one if these is full of color and stunning design talent... they are so beautiful all tucked together into a basket. 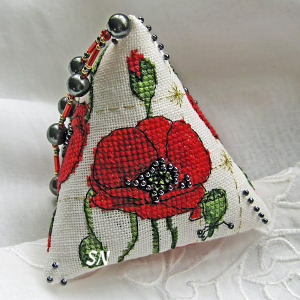 Small 4 x 4-ish designs (stitch counts are 70 x 70 in size), there are poppies, Iris, roses, violets... they can be finished any number of ways... the Biscornu shape is simply a suggestion! Offered as a chart, DMC flosses in the color key, this calls for 32ct White Belfast Linen. Swirling waves surrounding a tiny sailboat, this is such a pretty piece. The shape of the cushion just adds to the movement of the rolling waves. 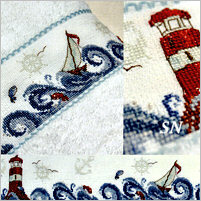 Stitched on 32ct antique white Belfast linen in a dozen shades of DMC floss, the stitch count is only 60 x 60. Offered as a chart. From Faby Reilly... we have the loveliest STAR-SHAPED ornaments! 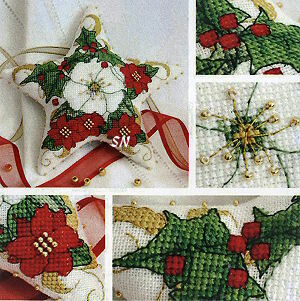 Beautifully presented in chart format, each star is stitched on 32ct White Belfast Linen in regular DMC flosses and garnished with Mill Hill gold seed beads. Such brilliant colors, the stitch count is approx 90 from tip to tip. Her designs are really classy, and Creative Poppy's Pascale -- a gal in Paris, France that publishes them for her -- does a wonderful job. 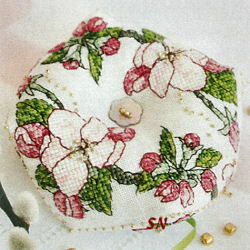 (Only Pascale is living in Japan right now... so these patterns have been around the world even before you own them!) Clear, colorful charts and instructions, we have an entire collection of biscornus and pendeloupes of Faby's that all match... so take a peek! 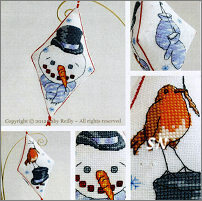 Offered as a chart, it is a delight to page through and stitch! Wow... what a pair! Beautifully presented with large, colorful charts and EXCELLENT photography on the chart cover, each of these features a slightly different beaded edging trim around it's many sides. 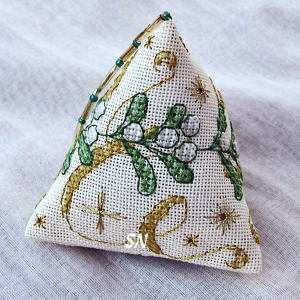 32ct Antique White linen... regular flosses and beads.. just exquisite little pin cushions when the stitching is finished. Beautiful colors, elegant designs! Offered as charts. Here are gorgeous offerings -- some that match Faby Reilly's Humbugs - some that don't. Beautiful florals, each is a square design, that is shown finished into a small pin cushion. 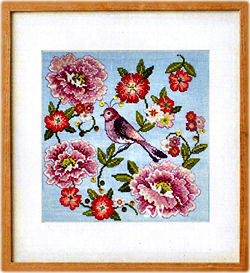 You *could* frame these -- they don't require their unique assembled shape to be this pretty! The charts are so clear, the front pictures are perfect. 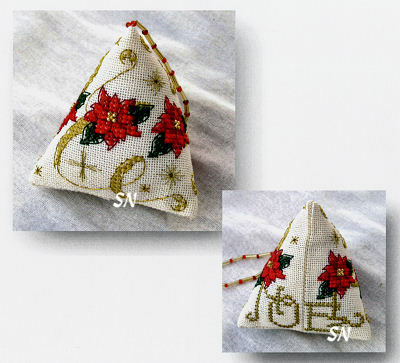 Charted for DMC flosses, each features a specialty stitch or two, (Ribbed Spider Webs or Eyelets for example) and is garnished with beads, and something special to grace their center tied area. Gorgeous! If you need something fun to garnish your centers -- just let us know -- we have lovely buttons and Mill Hill Treasures we can choose. 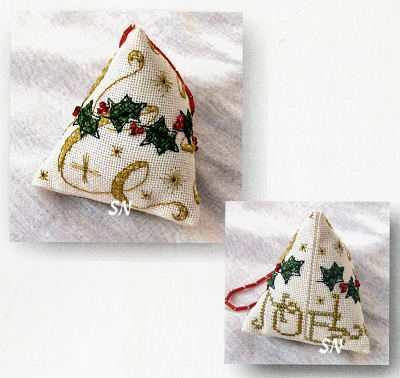 Lovely, elegant Christmas ornament designs by Faby Reilly Designs of Paris, this tiny trio of 2 x 2-ish ribboned florals will look pretty on your tree. ***Beautifully Charted*** for DMC floss and Light Effects metallics, each features Mill Hill glass beads, too. Work them on any 28ct count you like... the charts come with a page of NINE actual photographs of the Humbug assembly procedure -- terribly easy when you see the pics! 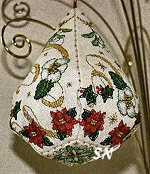 This is a neat shape for a stitched ornament... a pendant, with a flat bottom! Christmas Roses and Poinsettias decorate everywhere with a flourish! A companion to Faby Reilly's Humbug ornaments, this is also offered in chart format with 20 little photographs of the finishing process!!! A very clear chart, they have color coded the backstitch lines. Charted for DMC floss, I THINK this must finish approx 6 x 3... stitch count is 160 x 80... but it's wrapped... the bottom panel has a stitch count of 20 x 20, so on 28ct, that little bottom panel is 1-1/2 inches square. We have to get our shop model done ASAP! An absolutely lovely chart. Cute, cute, cute! 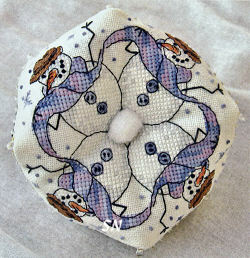 Even the bottom side is stitched with noses, hats and scarves -- after the snowmen have melted!!! 60 x 60 Stitch count, work this on any white even-weave you wish, charted for DMC flosses... the center is garnished with a white pom-pon!